Khao Sok National Park is one of the most beautiful national parks in Thailand. Due to its majestic scenery and biological diversity the park is nicknamed the ‘Gui – Lin of Thailand’, which refers to a very beautiful place in China. The name ‘Khao Sok’ is derived from the word ‘ Ban Sop”, which means ‘house of dead bodies’, The Royal Forest Department declared Khao Sok as the 22nd national park of Thailand on December 22nd, 1980. The park has a total area of 738.74 square kilometers, which covers parts of the Khlong Yee and Khlong Pra Sang forests as well as portions of the Krai Son and the Khao Pung sub-districts in the district of Ban Ta Khun and the Khlong Sok and Panom sub – districts in the province of Suratthani. 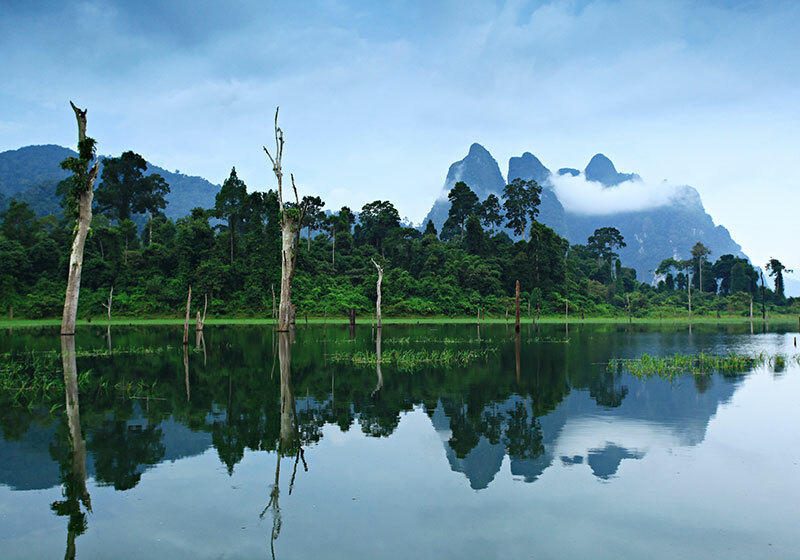 The Khao Sok National Park has a general topographic composition of Limestone Mountains and possesses the scattered peaks of Ka Lo Mountain whose form resembles those of towers. The highest peak to reside in the park measures at 961 m above sea level. The area in which the park is located contains highly acidic, sandy soil that is easily eroded during rainstorms. Short Description: Khao Sok National Park is a nature reserve in southern Thailand containing dense virgin jungle, towerlike limestone karst formations and the man-made Cheow Lan Lake. It’s home to rare species such as the giant parasitic Rafflesia flower, hornbill birds, gibbons and tigers. The park can be explored by elephant-back safari, hiking trail, and raft, canoe or kayak via the Sok river.